Jammu and Kashmir was brought under Governor’s rule on Wednesday and the state Assembly put under suspended animation, a day after the PDP-BJP government collapsed with the BJP ending the three-year-old alliance with the regional party. As Governor NN Vohra held multiple meetings in Srinagar during which security measures were discussed, Army chief Gen Bipin Rawat said the ongoing military operations in the Valley against terrorists would continue as earlier. Governor’s rule in the state is unlikely to have any impact on ongoing operations, he said in New Delhi. It is for the fourth time that the sensitive border state was placed under Central rule in the last one decade — all under the tenure of Vohra, who was made the Governor in June 2008. This is the eighth time in the last four decades that the state was put under Governor’s rule. “The President has approved imposition of Governor’s rule in Jammu and Kashmir with immediate effect,” a Union Home ministry spokesman said in New Delhi in the morning. An official gazette notification issued in Srinagar said the Governor Vohra has put J&K Legislative Assembly under suspended animation. The six-year term of the current Assembly ends in March, 2021. Vohra had on Tuesday night recommended imposition of Governor’s rule in a report sent to the Rashtrapati Bhavan around the time when President Ram Nath Kovind, who is on an overseas trip, was onboard his special aircraft. The contents of the Governor’s report were immediately sent to Suriname where the President was scheduled to land at 6.30 pm (3 am IST). The president after perusing the report gave his assent and the same was sent to the Union Home ministry by 6 am (IST) following which the process of promulgating Governor's rule was prepared and sent to Srinagar. “Immediately after receiving the President of India’s approval, Governor NN Vohra issued the proclamation to impose Governor's rule in the state under Section 92 of the Constitution of Jammu and Kashmir today," a Raj Bhavan spokesman said. After assuming charge as the head of the state administration, Vohra held meetings with top civil administration and police officials at the Civil Secretariat. The Governor held discussions with chief secretary BB Vyas and identified the major tasks which shall require to be dealt with on a strict time-bound basis, beginning Wednesday. Security preparations for the annual Amarnath yatra also figured during the meetings. Security forces have already been asked to maintain “highest level of alertness” and “synergy,” police said. The two-month long pilgrimage to the cave shrine of Amarnath will commence on June 28. The break-up of the PDP-BJP coalition triggered celebrations in parts of the Valley, even as some people expressed apprehension that Governor’s rule might lead to lack of transparency and worsen the situation in the state. In several areas of Kashmir, including Srinagar, Kupwara and Pahalgam, people burst firecrackers after the news broke out. “This alliance was unholy. The PDP should not have joined hands with the BJP in the first place. But better late than never. We are happy that this alliance has ended,” said Faizan Mir, a resident of Srinagar. “A democratically elected government is much better any day than the Governor's rule which essentially means New Delhi’s direct rule in the state where now they will have absolute control over the administration and the security apparatus. They can do anything now in the absence of a government which otherwise could built pressure on them on certain issues,” said Feroz Ahmad Bhat in Ganderbal. On whether he considered the ceasefire a mistake as it turned out to be the bloodiest Eid in the valley in recent years, the Home minister said it was not true that big attacks had not happened on Eid in the past. “I don’t think the ceasefire was a mistake. 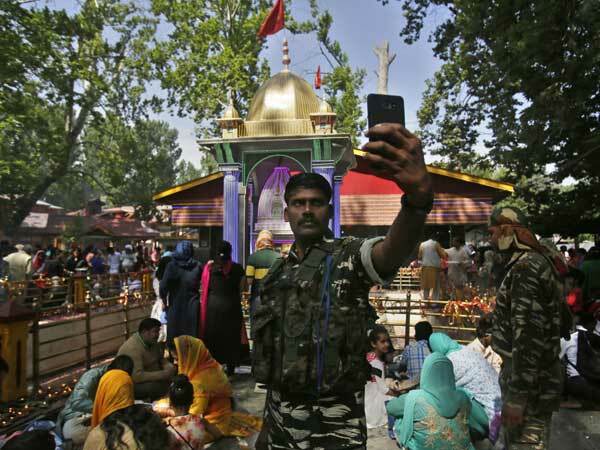 It was a decision taken keeping in mind people in Kashmir who wanted peace and wanted to celebrate the pious month of Ramzan in its true spirit,” he said. He added that security forces were never stopped from neutralising the terrorists, who were infiltrating from Pakistan, and the government didn’t call it a ceasefire. It was suspension of operations for a month, he said. Meanwhile referring to a recent UN report on human rights situation in Kashmir, the separatists filed a petition with the United Nations Human Rights Council (UNHRC) demanding the establishment of an independent international commission of inquiry to conduct a comprehensive investigation into alleged human rights violations in Kashmir. The petition, filed by Syed Ali Shah Geelani, Yasin Malik and Mirwaiz Umar Farooq, has listed a number of instances of alleged rights violations claiming these necessitate the establishment of an independent international inquiry.